Whatever the reason may be for your quick move, I’m jealous of you. The first time I needed to find an apartment in a hurry, I had two weeks to move—which meant one weekend to find a place and one weekend to pack my stuff and go. I had to do it the “old-fashioned way”—scouring one website after another with little to no information, calling communities to try and schedule tours, and then just showing up and begging people to show me around on-the-spot. You however, have Bozzuto.com, which makes it easy to find a new place to live fast. With these hurried apartment-hunting tips and Bozzuto’s awesome tools, you’ll be in your new home in no time. Happy hunting! Pet-friendly? Within 2 miles of work? In-unit washer and dryer? What are your absolutely-no-matter-what-must-haves? Create a “must-haves” and “can live without” list, and then focus your search on communities that meet your “must-have” checklist. Bozzuto.com makes it easy to search for communities by city and neighborhood. Once you’ve found a few communities in the area you’re checking out, you’ll be able to quickly scan their amenities, services and retail. From there, effortlessly narrow down your selection to the ones that meet your “must-have” list. Save communities and floor plans that you love. Schedule and edit all of your tours. You can even automatically add tours to your calendar and book a ride share to come pick you up. Share your tours and favorites with a roommate, significant other, friends, etc. Find out as much as you can before your hunting days. If you’re unsure about anything, call or email to ask for more information on available floor plans, rent prices and any other details you need to help you decide. The only thing that’s worse than finding out an apartment costs more than it was listed for, is discovering a laundry list of fees. 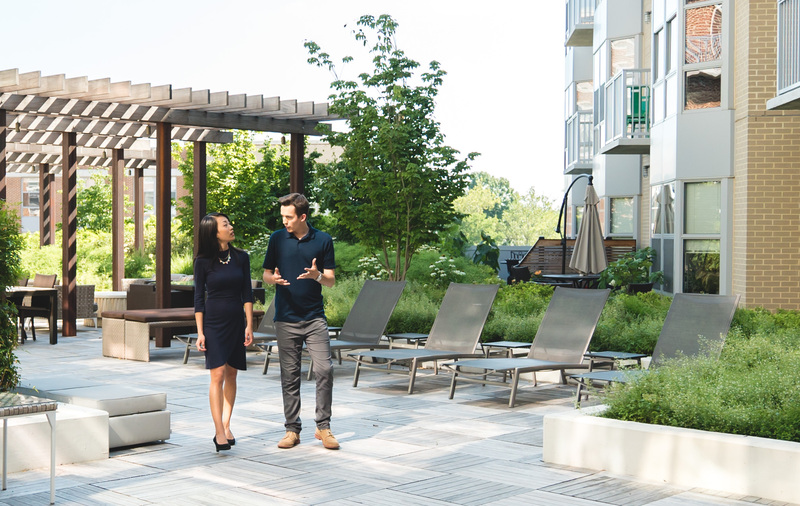 When you don’t have a lot of time to find a new apartment it’s easy to miss any extra costs that aren’t built into your monthly rent, or to waste time visiting places you can’t afford. You don’t want to wind up paying more than you expected just because you’re in a hurry. With real-time prices and a total cost calculator, Bozzuto.com has minimized those frustrations. Sure prices go up and down in the real estate world, but there shouldn’t be any crazy surprises. See the monthly price of that specific floor plan. Check additional fees for things like parking and pets. 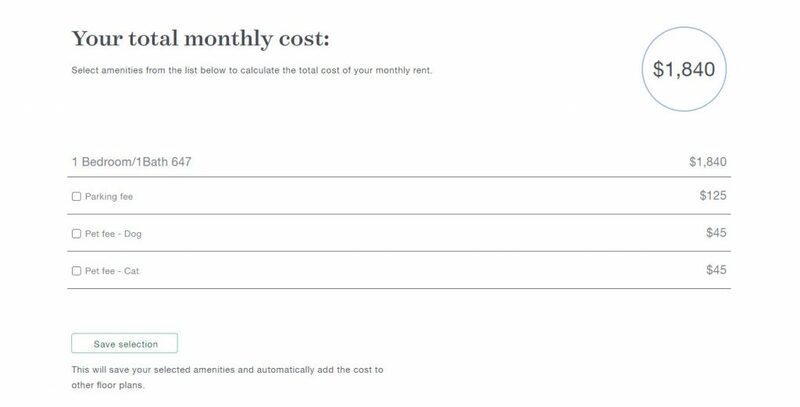 Add all of that up to see your approximate total monthly cost. Save your fee selections and see how they affect other floor plans. Before you decide whether or not to buy another avocado slicer on Amazon or to make reservations at that new Korean BBQ spot you turn to trusty online reviewers. Why wouldn’t you do the same when picking an apartment? 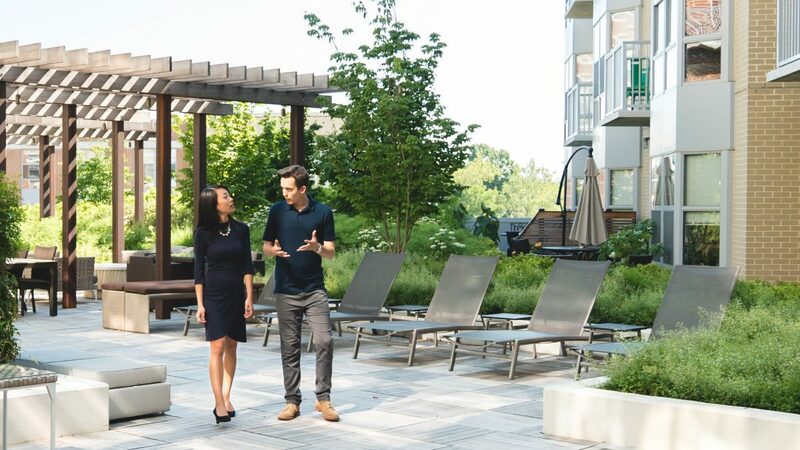 As the #1 resident-reviewed property management company in the U.S. for the past four years in a row, Bozzuto knows how important reviews are when you’re searching for somewhere to live. That’s why, Bozzuto.com puts its communities’ reviews right on its own website. You can see exactly what residents said about their current or past apartment on ApartmentRatings.com, Google, Yelp, etc. all in one place. And no, this isn’t like a dating profile where we only include the best of the best (no pretending to be 10 inches taller here)—we put it all out there because we put our residents first. Once you’ve got your tours booked and you’re ready to go, keep all of the communities you’re touring straight by taking good notes. 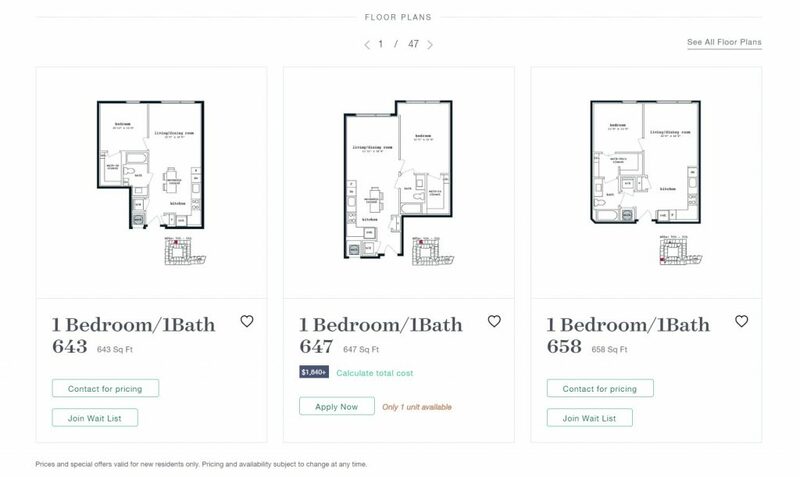 Download and print our Bozzuto Apartment Hunting Planner to keep your organized. Jot down everything you learned before and on your tours so you can compare and contrast your top choices later on. Bringing along a friend or family member on the day of your tours can be helpful. They may remember to ask questions that you forget, or notice things about the community that you missed. It’s also nice to talk through all of your options with a trusted companion. While you may need to make your pick right away, if you can, it’s a good idea to sleep on it. Narrow down your list right away, be ready to go with the necessary documents and in the morning make your ultimate decision. Need a new apartment fast? We’ve got the place for you (and the tools to help you find it!). Quiz: What Kind of Neighbor Are You?